Working collaboratively with schools, business, healthcare, government agencies, social services, criminal justice systems, healthcare organizations & faith communities to become a trauma-informed community. We invite all concerned citizens, professionals & advocates to partner with us to raise awareness about trauma & its effects, to build resilience, and offer hope & healing. The About Child Trauma Foundation is "Off to the Races!" 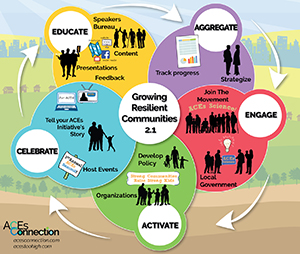 The second session of the Starting & Growing Resilient Communities: Online & IRL (In Real Life) was a success. Many members tuned in and were able to learn more about mission/vision statements, creating norms and strategic planning. I have embedded the video in this post. The third session, Launching Your ACEs Initiative , will take place March 15th. If you have any questions about the series, please contact Ingrid Cockhren , TN & Midwest Community Facilitator.